Want to be notified of new releases in realm/realm-loginkit? A general purpose account login user interface for apps implementing the Realm Mobile Platform. 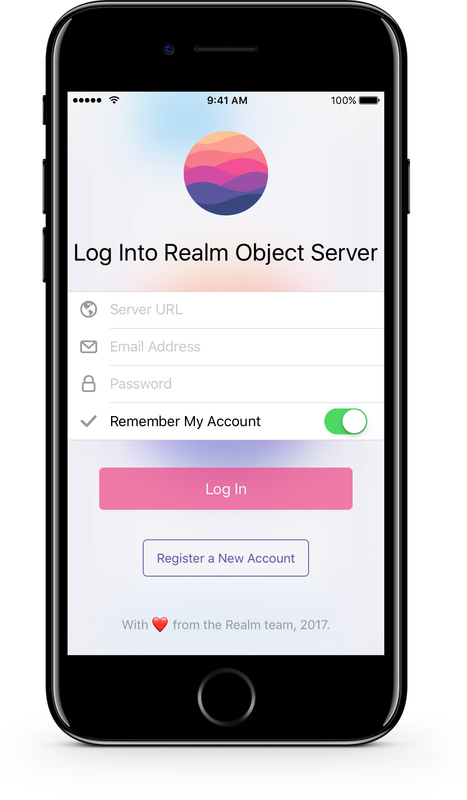 Realm LoginKit is a UI framework that provides a fully featured login screen for apps that make use of the Realm Mobile Platform. It has been designed to be easily dropped into existing app codebases, and to provide a fully featured interface allowing users to either log in, or register new accounts in that app. Easy swapping between 'log in' and 'sign up' modes. Optional settings to hide the server URL and 'remember me' form fields. Realm LoginKit only supports iOS at the moment. Currently in development, and should be finished soon. Currently on the roadmap with development starting soon. Realm Objective-C - The Objective-C version of the Realm Mobile Database. TORoundedTableView - A subclass of UITableView that creates rounded table sections when view on iPad. In order to run the Realm LoginKit demo app, it is necessary to install CocoaPods in order to integrate the third party libraries. Open Terminal, and navigate to the root Realm Puzzle directory, e.g. cd ~/Projects/realm-loginkit. Run pod install to install the necessary dependencies needed by Realm LoginKit. Open RealmLoginKit.xcworkspace instead of the xcproject file. CocoaPods is the recommended way to install Realm LoginKit into an app as this will automatically manage recycling Realm Objective-C as a dependency. In your PodFile, simply add pod 'RealmLoginKit'. You can also integrate Realm LoginKit manually; simply copy the RealmLoginKit folder to your app, and drag it into Xcode. That being said, you will also need to install the dependencies separately as well. See their respective GitHub repositories for installation instructions. Realm LoginKit is licensed under the Apache license. See the LICENSE file for details.